The summer boating season is still going strong up and down the coast, but autumn is inevitably on the way. In the Northeast, that means boat show season. The organizers of a few regional staples are preparing for a return. * The Newport International Boat Show, one of the largest in-water boat shows in the country is 40 years old. The Sept. 16-19 show covers more than 13 acres along America&apos;s Cup Avenue with more than 750 exhibitors and 600 boats ranging in size from 16 to 85 feet are expected to be on display, including express cruising yachts, racing sailboats, oceangoing trawlers at PassageMaker magazine&apos;s TrawlerPort, a Multihull Lagoon, plus Down East styles, sportfishing boats, runabouts, kayaks, canoes and inflatables. In addition, there are engines, sails, equipment, safety products, electronics plus thousands of accessories and marine services, as well as seminars, demonstrations and workshops. For information, call (401) 846-1115 or (800) 582-7846 or visit www.newportboatshow.com. * The 35th annual Norwalk Boat Show is set for Sept. 23-26 at Norwalk (Conn.) Cove Marina. The in-water boat show offers hundreds of luxury motor- and sailing yachts, sportfishers, performance boats, sailboats and a large selection of marine accessories. This year&apos;s event includes an appearance by Russell Newberry, deck boss from the TV show "Deadliest Catch," who will meet and greet fans throughout the show; the Affordability Pavilion, featuring boats that can be financed for less than $250 per month; and the Kids&apos; Cove, where junior boaters can paddle on the mini-lake, go-kart racing and more. * The annual Boston Fall Boat Show will return Oct. 1-3 to the Seaport World Trade Center. This year&apos;s event will "fill the building" with the very latest in new boats ranging from rowboats up to 40 footers. 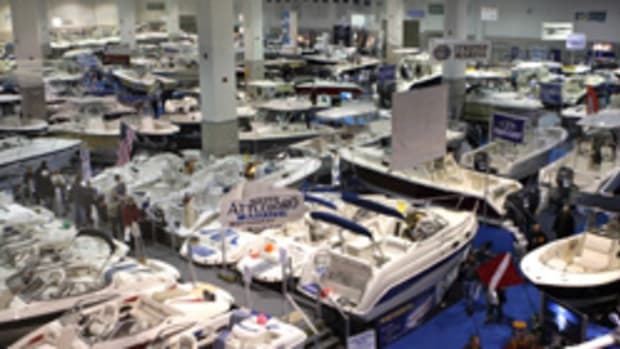 It will be the premier showing for the 2011 model runabouts, ski boats, deck boats, pontoons, fishing boats and cruisers. And, for the first time, this year&apos;s show will feature late-model used and brokerage boats from New England&apos;s leading dealers and brokers. The show will feature a collection of fully serviced, cleaned and detailed used boats in the 15- to 35-foot range. All used boats will be highly desirable brands less than 10 years old. For information, visit www.bostonfallboatshow.com or call Vernon Promotions at (978) 777-4439.